Cécile de Troyes has her whole life ahead of her–she is just about to turn 17, and now she is old enough to join her mother in the city and learn to sing for the stage. Cécile has a beautiful voice, and while she loves living with her family on their farm, she is eager to sing, to use the talent she’s been given. Except, of course, life seldom works out as you expect. Instead of celebrating her birthday with her family and friends, Cécile is kidnapped and taken far underneath a local mountain. She has been sold, it seems, to trolls. Now, in a city that never sees the sky, Cécile is a prisoner to beings of darkness and magic. The trolls are trapped in their mountain city, trapped by the curse of a human witch, and the centuries of their captivity are taking a toll. Cécile, a girl of flaming hair and the voice of an angel, has been prophesied to be the key to unlock their terrible cage. The only catch is that in order to unlock the mountain prison, Cécile must become the wife of the troll prince, Tristan. This debut title is an exceptional start to the Malediction trilogy. I immediately liked Cécile, for while she is young, she isn’t stupid. Though frightened, she keeps a clear head and treats the trolls with respect. By keeping her wits about her, she begins to see that the trolls aren’t simply evil creatures with deceitful hearts, as myth portrays them. Rather, she sees that many of the trolls are kind, caring, and trying desperately to do the right thing, for both their own people, and for the humans that inhabit the world outside of the mountain. She is instantly attracted to prince Tristan, not only because he is handsome, but he is trying to become a proper leader for his people. And it is Cécile, and not Tristan, who truly thinks his people belong once again in the light. This is a marvelous book, and I read it obsessively. The world building is very good, and I liked the entire cast of characters, including the more…evil ones. The storyline is complex–there are no easy answers here, and I applaud that. The system of magic, especially the magic used by witches, is not as well defined as I’d like to see, but I have hope that this will be rectified in the next book. And really, I enjoyed the first one so much that the next book can’t come out too soon! 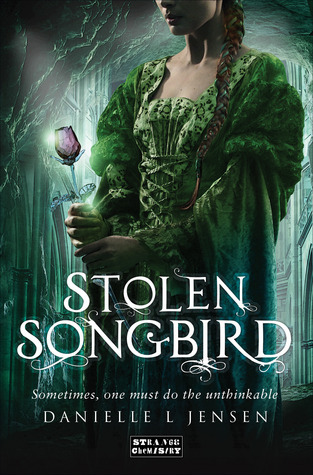 Stolen Songbird is available now, both in paperback and ebook editions. The Kindle version is priced at only $5.79, so really, you have no excuse. Buy it now!